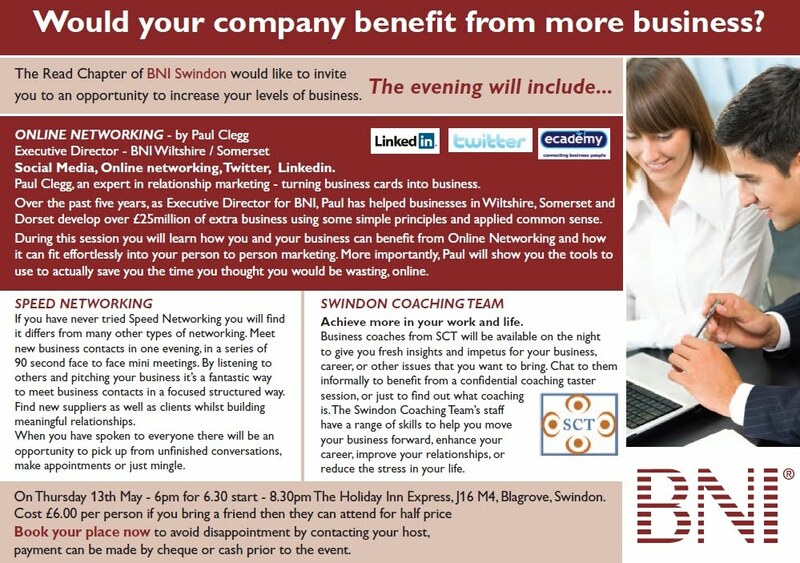 Swindon Coaching Team, of which I am a part, is teaming up with BNI in Swindon to offer both free coaching taster sessions and a workshop on using social media (such as Twitter and Facebook) to help you to develop your business. There's even speed networking available too for those who'd like to try it! All this is happening at the Holiday Inn Express at M4 Junction 16, Thursday 13th May 2010, 6:00 p.m. for 6:30 start until 8:00. £6. Bring your friends. Contact me to reserve a place. 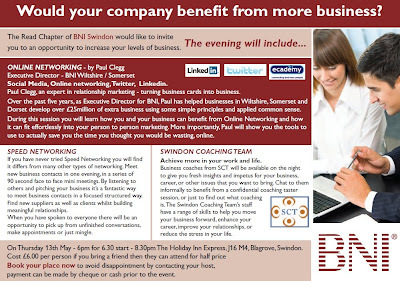 More about BNI here. I'm part of the Ushers Chapter that meets in Melksham. Is a stand-up debate the way to choose a politician? I've been making use of Carl Jung's understanding of people, and Myers Briggs, for many years, but am deepening my understanding while I attend an accreditation course. Stand-up debate is a great way to find out the best about extraverts; but people with an introvert preference keep their best strengths hidden. Maybe the person who is best for a job is not the one who is great at talking, but the one who does the best quiet thinking or research. How much of modern politics is really about exchanges in the debating chambers of the Palace of Westminster? Which of these are you more likely to say? "If you don't know where you are going, you are not likely to arrive there." "If I don't know where I'm going, I may end up somewhere more interesting." A recent British newspaper article intrigued me. It said that different kinds of work prospered under different governments: under Margaret Thatcher entrepreneurs thrived; under “New Labour” managers have thrived. It suggested that there are now too many of them, saying by way of example that the number of beds per manager in the National Health Service has declined so the service is less efficient. In any case, what is more important than how many managers there are, is how leadership is exercised. Many people assume that the management and leadership are the same thing. However it is not so. A manager builds and marshals resources – often including people – in order to deliver particular results. The responsibility of leaders is to hold up and develop mission, vision, and strategy and to motivate and align people towards that achievement. The leader sees people as assets and seeks to encourage people to use their gifts and strengths for the common cause. This means that managers can be great leaders, and that a leader does not necessarily do management work. Leadership is about direction and about influence, so I agree with those who say that we are all called to be leaders even if we do not hold a leadership post in an organisation. To lead well we need to have the right attitudes, particularly to people, and to build an environment where everyone is able to contribute to, and buy into, vision and goals, and given freedom to use their particular skills and initiative to reach those goals. With these attitudes, coaching is a good way to support staff to achieve their objectives and to contribute to organisational goals. We also need to be aware of the different approaches that underly this, for example Douglas McGregor's Theory X and Theory Y. For more information about this, go to our web site Leader of Manager?